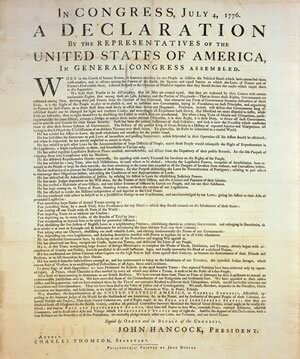 The Declaration of Independence was adopted by the Continental Congress on July 4, 1776, two days after Congress passed Richard Henry Lee’s resolution for independence. Despite the incongruity, it is the Declaration that has come to be the defining moment of independence in American history and culture. But just how did the document come about? The political and military circumstances in Congress and in the colonies themselves in the spring and early summer of 1776 gave birth to and shaped the Declaration. Decoding the Declaration, however, requires going beyond the universal preamble, as the document was addressed to multiple audiences and with multiple agendas and goals embedded in it. Recently, historians have begun to rethink the Declaration both textually and contextually, as well as the document’s global impact. Why did independence take so long? What were the political circumstances in Congress and in the colonies that brought it about? How did those circumstances shape the Declaration? Why was a declaration necessary? Where did the ideas enshrined in the preamble come from? What were the Declaration’s goals? To whom was it addressed? How do historians teach the Declaration of Independence? Allen, Danielle. Our Declaration: A Reading of the Declaration of Independence in Defense of Equality. New York: Liveright, 2014. Armitage, David. The Declaration of Independence: A Global History. Cambridge: Harvard University Press, 2007. Becker, Carl. The Declaration of Independence: A Study in the History of Political Ideas. New York: Harcourt, Brace, and Company, 1922. Boyd, Julian. The Declaration of Independence: The Evolution of a Text. Washington D.C.: Library of Congress, 1943. Hogeland, William, Declaration: The Nine Tumultuous Weeks When America Became Independent, May 1-July 4, 1776. New York: Simon & Schuster, 2010. Ellis, Joseph J., ed. What Did the Declaration Declare? Boston: Bedford/St. Martin’s, 1999. Maier, Pauline. American Scripture: Making the Declaration of Independence. New York: Norton, 1997. Pincus, Steve. “1776: The Revolt against Austerity.” New York Review of Books, May 20, 2015. Raphael, Ray. The First American Revolution. New York: The New Press, 2002. Slauter, Eric. “The Declaration of Independence and the New Nation” in The Cambridge Companion to Thomas Jefferson. Edited by Frank Shuffleton. New York: Cambridge University Press, 2009. Wills, Garry. Inventing America: Jefferson’s Declaration of Independence. New York: Mariner Books, 1979.